I absolutely love Thanksgiving (just six more days! ), for a number of reasons. First and foremost, I think a day set aside specifically devoted to feeling and expressing gratitude is pretty awesome. I also love the fact it’s a nice break for a day or two in the middle of one of my busiest times of year with work, and I don’t have to feel any sort of guilt about just being lazy. It also marks the official start of the holiday season, which (despite my undying love for summertime) is truly my favorite time of the year. And of course, there is nothing better than gathering with friends and family to enjoy food and the comforts of the season. We aren’t hosting any Thanksgiving celebrations this year (we’re headed to a Friendsgiving this evening, and we’ll be eating Thanksgiving dinner at my dad’s), but we do plan on having a holiday dinner here in a few weeks. So I thought I’d share my grocery list for the types of things we’ll be getting for our little get-together. Since I’m a vegetarian and so are several of our guests, we’ll be getting vegetarian goodies and creating a holiday theme with the decor. The best part is that we’ll be able to focus on cooking and on the design aspects of things without the added stress of having to run around to various grocery stores for ingredients – because we’ll be able to get everything we need delivered directly to our home, thanks (once again!) to Peapod. I’ve talked about Peapod here before, last month when I used them to supply an autumn picnic I was putting together. They’re a seriously great service (and the country’s leading internet grocer) that delivers right to your doorstep, often up to seven days a week – for delivery as soon as next day, or up to two weeks in advance. They’ve delivered more that 23 million orders (impressive!) across 24 U.S. markets, and they are stocked with more than 12,000 products in a range of categories. I love how many natural and organic foods they offer, and the fact that they go beyond just typical groceries for also supply seasonal items (like the holiday bouquet and door swag you see above! ), office and school supplies, health and beauty aids, pet goods, and wine, beer and spirits (in specific markets). I think Peapod is especially wonderful during this time of year when we’re all so busy – they instantly take an errand off of your to do list, which is pretty fantastic. 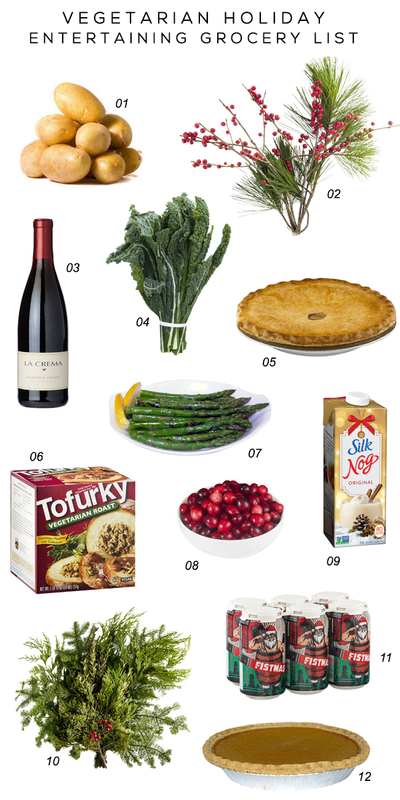 What types of groceries and other goodies do you tend to get for holiday entertaining? Who else is a Peapod fan? This post is in collaboration with Peapod.com. Thank you for supporting the sponsors that help make Bubby and Bean possible.